“Graphic methods for presenting facts” is an impressive, early survey of what would today be considered to be bare-bones statistical diagrams and graphic techniques that existed at that moment. Now scarce in original form, this early volume is recognized as the first American book focused on graphic techniques geared for a general audience. 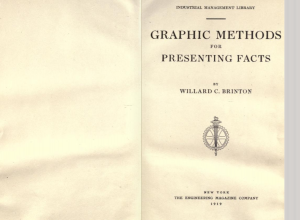 Willard Cope Brinton (December 22, 1880 – November 29, 1957) was an American consulting engineer, president of Brinton Associates, and information visualization pioneer, particularly known for publication of the 1914 textbook on graphic methods, entitled Graphic methods for presenting facts.